Having grown up in Ohio with its summer thunderstorms, I like “dynamic” weather. I enjoy riding my bike in the rain, even if the rain is hard and the wind is blustery, so long as it's warm. If I know it's going to rain, I know I'll get wet and so I'll prepare accordingly, and I'll embrace the rain instead of try to avoid it. This lack of fear of getting wet is apparently sufficiently rare that it makes me appear to be “crazy” in the eyes of many. Whatever. I enjoy it. A “supertyphoon” was forecast to pass near Kyoto at about 2pm, so I thought I'd go out for a ride beforehand, to enjoy some of that “dynamic” weather before it got too bad. I set out at about 10am intending to do a loop that normally takes me about two hours. There was no rain yet, but the wind was a bit blustery. Half an hour into the ride, I came to “Zenkoji Flyby Northbound”, a short punchy segment, and I hit it hard. On my previous visit last week, I set a new personal record and came within 8 seconds of the KOM (“King of the Mountain”, the best-recorded time), despite having to go somewhat gingerly because the road was wet in some areas. Today the road was dry and I was feeling really good, putting out more than 1,000 watts at the start, until I came around a corner near the end to find the road was closed. Someone saw me standing there in front of the gate, and told me "oh, it's fine for you to go... we just put that there because the typhoon is coming." Great. I was bummed, because I'd been I was 8 seconds ahead of the current KOM's pace, so I certainly would have gotten it. I asked whether I could move the gates aside temporarily so I could give it a try, and he said something along the lines of "I'd like to say yes, but the city asked me to put the gates there, so I can't". Oh well, I'll try again after the ground drys off. It wasn't until an hour an a half into the ride, at 11:20am, that it started to rain.... just a mild, spritzy-drizzle. The wind continued to have stronger gusts at times, but it was still entirely fun and not even close to being any kind of danger. So, I decided that once I got back to Kyoto, instead of heading home I'd pop into the mountains a bit, and I invited a few friends to join. 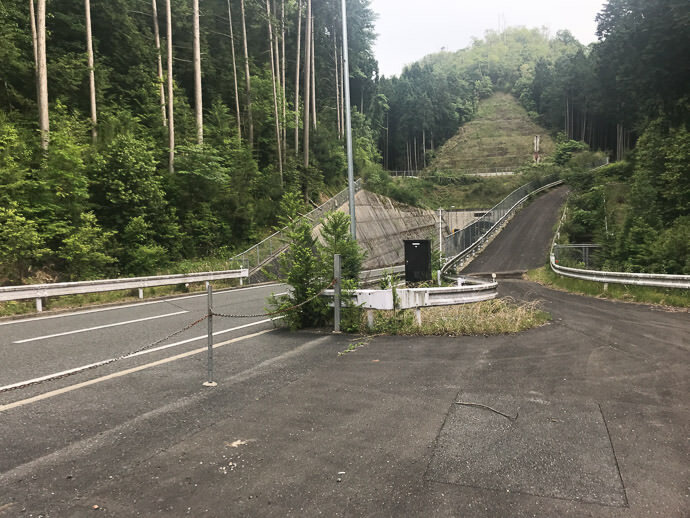 I returned to Kyoto around noon, and met up with the one friend who could join, Maithilee, and we headed off to do the western half of Kyoto's Heart Loop, starting with the climb up to Kyomi Pass. At this point the wind was definitely “dynamic”, but not dangerous. Still, I wouldn't want to stay out if it got much worse. It started to get stronger as we neared the top, and I thought we should abort the ride and head back soon. Let me make it clear that I'm intimately familiar with the damage a typhoon can do. As seen in “2017’s Typhoon #21 (Lan) was Quite the Doozy for Kyoto”, trees and utility poles were snapped like toothpicks. I want no part of that, and we were no where near that point. I wouldn't be near that point if it were near that point. Still, the debris were also getting bigger, and especially with her not having a helmet, I worried about a branch or something bonking her on the head, so head back soon we would. Back in town it was much calmer. On the way out of town, we'd noticed that a friend had left her windows open, so on the way back down, with the rain now getting stronger, we stopped in to close them for her. We also took the opportunity to try a short segment nearby, that I've been wanting to get the KOM on. In the past I'd come close, but had trouble with bad GPS tracking (my pause after having completed the segment would somehow get added to my effort time), or with having to abort the attempt because of people or cars or something. Today I wasn't sure whether I should even bother, because the wind felt like it was blowing all directions at the same time, but I gave it a shot and did well and got my KOM. I'll want to go back on a less-blustery day to see just how much of that was from the weather and how much was from me. By this point the wind was still much more calm than in the mountains, but the rain had started to pick up. Just before we got to her place, a gust of wind came that was unlike anything I'd experienced since my rides up Mt. Fuji a couple of months ago. It was so strong, instinct brought us both to a halt and off our bikes, to steady ourselves. This was the real storm arriving. It was time to get inside, and we did. The storm raged outside as I fought with Apple's “Air Drop” feature, trying to send the photos and videos I'd taken to her phone. It normally works so smoothly, but for some reason just didn't want to work well this time. I eventually gave up and headed back out. I hadn't been there long, but the worst of the storm had clearly passed. I felt completely safe riding home, except for the occasional bit of flying sheet metal. I kept eagle eyes out for that, and otherwise enjoyed myself immensely. The wild weather was winding down quickly, so I called it a day and headed home. There are also now plenty of compilation videos showing more. There's also this video of Kyoto Station, often accompanied by text claiming that the roof was falling in. My guess is that the big square metal thing we see fall was actually blown from somewhere else, and simply came crashing through one of the glass panes. In any case, all these Osaka videos were quite a shock. 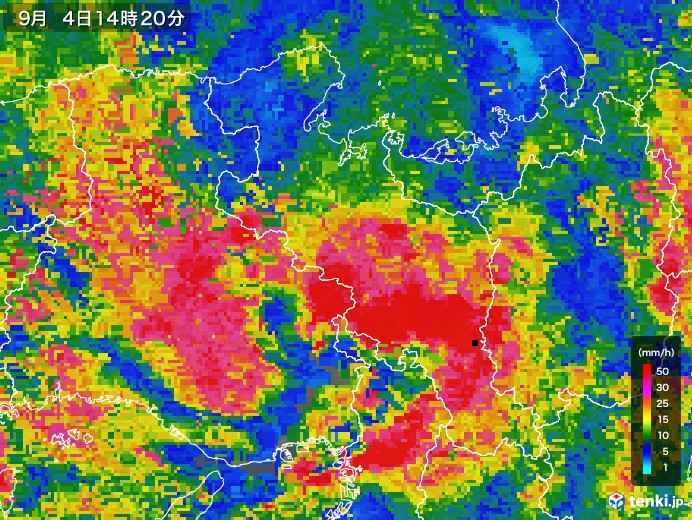 Kyoto didn't get hit nearly so hard, thankfully. The next day was calm and pleasant, and I took a ride to check out the mountains where I had been as the storm approached. That's a story for the next post, but let's just say that I'm very, very glad that I turned around and came back when I did. Thank you for your blog. I am very happy indeed I found it about a year ago. The pictures made me determined to see some of Kyoto during our 2018 trip and we did. That January 2015 photo of the Kaiuso gate in the snow is gorgeous, the ultimate snow in Japan photo for me. The light quality is just mesmerizing and draws you in.